Imagine looking closely at an object and noticing something previously unseen, a feature that demands a rethinking of what that object is. This is what happened when Santiago Ramon y Cajal, a Spanish doctor who�d dreamed of being an artist, first saw neurons under a microscope in the 1880s. The cells he saw had been prepared with a then-new staining technique that revealed the intricate branches and individuality of a few select neurons in the sample. At the time, most scientists thought of the nervous system as a mass of connected, mesh-like tissue. 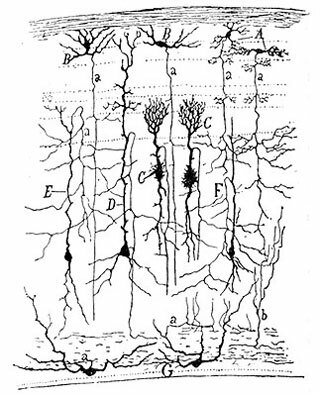 What Cajal saw confirmed his alternative idea that the nervous system is comprised of singular, discrete cells. Putting his artistic skills to work, Cajal painstakingly sketched what he saw. He looked at sample after sample, creating stunning sketches and exposing details that led him to what have become the foundational ideas in neurobiology�the neuron doctrine. In 1906, he won the Nobel Prize for his contributions. neural signals travel only in one direction, from dendrites toward axons. Cajal deduced all this by simply observing cells through the microscope and recording what he saw. Many biologists today do the same thing, using much more highly powered microscopes and sophisticated computer rendering. Cajal�s work is a testament to the importance of images and visualization in biology. Though research in the last few decades has revealed that relationships between neurons are more complicated than Cajal could have known, his observations and ideas have withstood a century of scientific advancement—an amazing feat considering the technology and knowledge available to him at the time. Many scientists consider the human brain the most complex object in the known universe. Within three pounds of tissue, one hundred billion neurons, each with tens of thousands of connections to others, engage in busy electrochemical conversations. The signals they send result in our thoughts, actions, words, and emotions; at some level, they are the stuff of consciousness. How does a collection of cells the size of a cantaloupe perform such magic? Surprisingly, we�re finding some answers to that question by studying the tiny, 10,000-neuron brains of the developing Danio rerio, commonly known as the zebrafish. What makes a brain powerful isn�t just its size or the number of neurons it contains, but the way those cells grow and connect to each other. Wiring a human brain correctly takes the effort of about 10,000 genes. About 80 percent of these genes are absolutely essential: if the expression of one of them is flawed, the whole system will be thrown off, and the resulting brain will function improperly (if at all). The body accomplishes a major feat in each of us when it correctly uses the products of these 10,000 genes to power the creation of more than 100 trillion neural connections. The cells usually associated with functions like thought and action are neurons, electrically active cells that process and transmit information (Other supporting cells, knows as glial cells, are believed to play a supporting role). Fortunately, human neurons are similar to the neurons of other animals—like zebrafish—making it easier for us to learn about ourselves by studying other animals. Neurons can have many shapes, but are typically highly branched. Their branches allow them to connect with other neurons. One part of the cell has a bushy, dense set of branches called dendrites. Dendrites are signal collectors: when stimulated by input from other neurons, their cell membranes change in a way that causes an electrical wave to travel over the cell�s surface. That signal will travel down the longer, less branched part of the cell called the axon. The connections between neurons, called synapses, are actually tiny spaces where neurons' electrical signals become chemical ones, as they move from one cell to another. The axon of the signaling cell releases a chemical (called a neurotransmitter) that travels to the dendrites of the receiving cell. The result may be either that the receiving cell is excited, and fires its own signal, or that it�s inhibited from doing so. A neuron usually gets input from many synapses at the same time, and the combination of those signals determines whether or not it will produce a signal in response. Interestingly, both the connections between neurons and their responses to signals change as our brains learn new things. Supported by a Science Education Partnership Award (SEPA) from the National Center for Research Resources, National Institutes of Health, and the David and Lucile Packard Foundation.